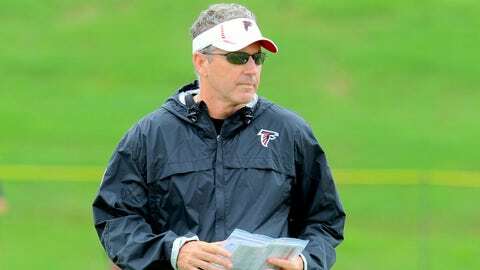 Dirk Koetter, who was the head coach at Boise State from 1998-2000, has directed the Falcons offense for the last two NFL seasons. FLOWERY BRANCH, Ga. — Offensive coordinator Dirk Koetter interviewed for the Boise State head coach vacancy, Falcons head coach Mike Smith confirmed on Monday. Koetter, 54, previously served as head coach of Boise State from 1998-2000 before leaving to become the head coach at Arizona State and "has hinted in the past that he would be interested in returning," according to a story in The Idaho Statesmen. He went 26-10 in those three seasons and twice went to bowl games. Koetter has many ties to Idaho. He is a native of Pocatello, played at Idaho State, received his master’s degree in athletic administration at ISU and then was a state championship-winning coach at Pocatello’s Highland High in 1984. The Broncos’ head-coaching job came open when former head coach Chris Petersen left to take the vacancy at Washington. "I’m aware that Dirk has spoken with the people at Boise State and I don’t believe it’s in the best interests for Dirk or for us to comment any further on that but I am aware that they have conversations," Smith said. Koetter, in his second season as Falcons offensive coordinator, installed a screen game that was badly lacking and was a major reason why the Falcons advanced to the NFC title game last season. In 2012, the Falcons offense finished second in the NFL in third-down efficiency (45.1 percent), second in scoring efficiency (44.0 percent), third in red-zone points scored (317), sixth in red-zone scoring efficiency (90.5 percent), sixth in first downs per game and seventh in both scoring offense (26.2 points per game) and passing offense (292 yards per game). This season has proved a different story, as injuries have ravaged the unit. Also, the Falcons’ offensive line has been one of the NFL’s worst this year, due to injuries and personnel issues. Former longtime center Todd McClure was forced into retirement and former Pro Bowl right tackle Tyson Clabo was cut for salary cap reasons. Their replacements have struggled, as left guard Justin Blalock has been Atlanta’s only offensive lineman to start every game at his position. Despite all that in a 3-10 season, the Falcons still rank 13th in the NFL in total offense, including fifth in passing yards. However, they rank 29th in rushing yards. Smith was asked how the loss of Koetter could hurt the Falcons if he chooses to leave. "I don’t play the ‘what if’ game," Smith said. "I’m not going to play that game. I do know that they’ve had conversations and I’m not going to play that ‘what if’ game in terms of what if ‘this’ happens. My focus and our focus and I know Dirk’s focus is on cleaning up the game from yesterday. That’s what they’re doing right now and then moving on to the Washington Redskins" — Sunday’s opponent. Blalock said he has enjoyed working with Koetter during the coach’s two seasons. "I think the first thing that comes to mind personally is his attitude and his energy," Blalock said. "He’s a guy that’s almost never had a bad day. Just always smiles and that really is contagious. Obviously, we’re not having the type of season that we would’ve liked coming into this thing and it would be really easy for everyone to sulk and just throw pity parties all the time but he does a tremendous job of being a professional. Coming into work, smile on your face, ready to go to work that day." Roddy White, the franchise’s all-time leading receiver, also praised Koetter, who has represented changes both stylistically and personality-wise from former coordinator Mike Mularkey. "He’s a good guy, good coach, good offensive coordinator, good mind," White said. "So if he takes the job, then he does and if he doesn’t, he doesn’t." White echoed a statement by Blalock that in the NFL, players are accustomed to seeing coaches come and go. "We got three more games," White said. ‘Whatever decision he makes is on him. He’s a grown man."